Every single strain from Flash Seeds Super-Auto collection has something new to bring to the table. And with these Spacer Auto seeds, it’s the incredible long lasting effect that you get from this little baby that makes her stand out. Flash Seeds own Chaze strain crosses with AK 47 to create the most delicious energetic euphoria that just seems to go on forever. Get ready to feel empowered, motivated and ready for anything, in a high rising effect that just doesn’t ever seem to want to leave. She’s beautiful for combatting stress, enigmatic in her fight against depression and wipes out anxiety as if it never existed. Stitch 0.2 genes ensure these seeds aren’t just powerful, they’re productive too. 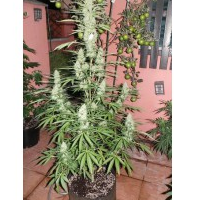 With up to 500 grams of the good stuff available in every plant. Spacer seeds are as fabulous for growing weed indoors as they are outside, with a pine, sweet freshness that fills the growing room before it fills the palate. When you want a power that lasts and lasts, Flash Seeds Auto Spacer are the one’s for you.